Euphoria is a name of yacht Nautitech 441 ,which has been manufactured in 2010. You can charter this vessel from port Martinique in region Martinique. Euphoria is equipped with 10 beds. Sleeping places on the vessel are arranged in 10 layout. 6 cabins are located inside the boat Euphoria. You can search other boats right here: Catamarans Martinique. Guests can feel comfortable on this boat , because there are 4 bathrooms for their disposal. With 400.00 l l. in fuel tank you can sail really far and still be independent because of 800.00 l liters in water tank. Euphoria is driven by engine 2 x 28 kw. Yacht's dimensions are: lenght - 13.47 meters , beam - 6.81 m and 1.20 m of draft. On the boat you can make use of following equipment: Autopilot, Gps plotter, Mainsail with lazy jack, Dinghy, Inverter 12v-220v, Solar panels. . Security caution is at the level of 4570.00 EUR. 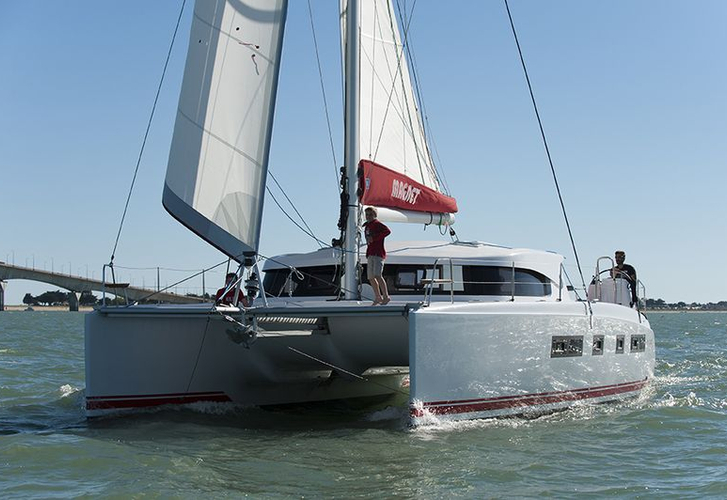 In our search machine you can quickly check avalailability of sailing boat Euphoria from Martinique by going to this section: Catamarans Caribbean.